Paco Díaz (Palma de Mallorca, Spain) on 27 March 2011 in Art & Design. 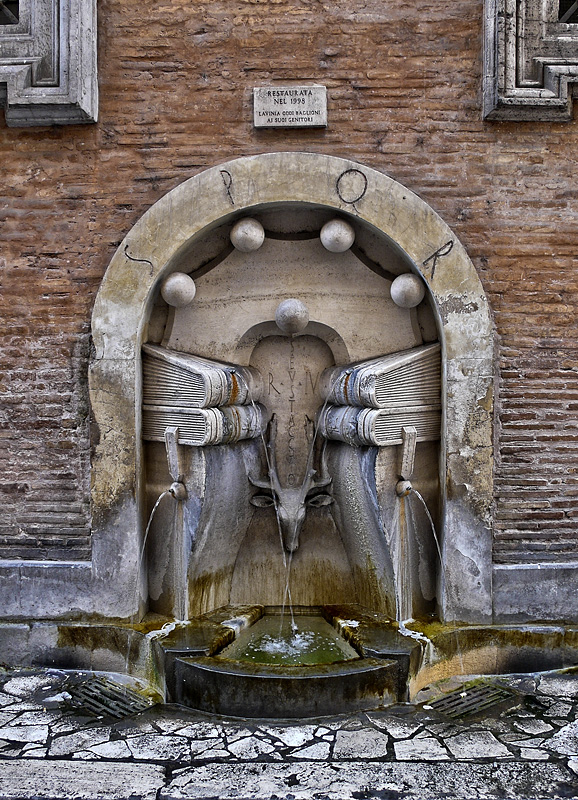 The Fontanella dei Libri was constructed in 1927 in travertino following the designs of Pietro Lombardi for the quarter of St.Eustacchio and it is for this reason that the district symbol of a deer's head appears in the niche surrounded by four antique books perhaps recalling the nearby Sapienza University. Inside the basin is written the name of the district with an incorrect numerical referral: IV instead of VIII. beautiful . a great looking fountain . a very unusual fountain with intriguing details! Splendide et originale cette fontaine, superbe cadrage. Bonne soirée. La source de la connaisance...très originale cette fontaine. Je connais assez bien Rome mais je n'ai pas vu cette fontaine, merci pour la découverte. Original fuente y buena vista. Una imágen espectacular, con una nitidez impresionante. Me encanta la luz tan suave proyectada sobre la fuente.